“Meet the Locals” is a 3-part blog series in honor of our local elasmobranchs (sharks and rays) and Shark Summer 2014. This is the first post. How many gill slits do sharks have? If you answered “five,” you’d be about 99% correct. Almost all sharks have five gill slits, with the exception of the sharks in the family Hexanchide. This group, also referred to as the “cow sharks,” have extra gill slits and includes the creatively named six-gilled and seven-gilled sharks. The broadnose sevengill shark (Notorynchus cepedianus) is one of these unique species that we can find locally in La Jolla. As its name implies, this shark has not five, but seven gill slits. As a member of the cow shark family, it is considered one of the more primitive sharks, with its skeleton closely matching that of its extinct relatives. 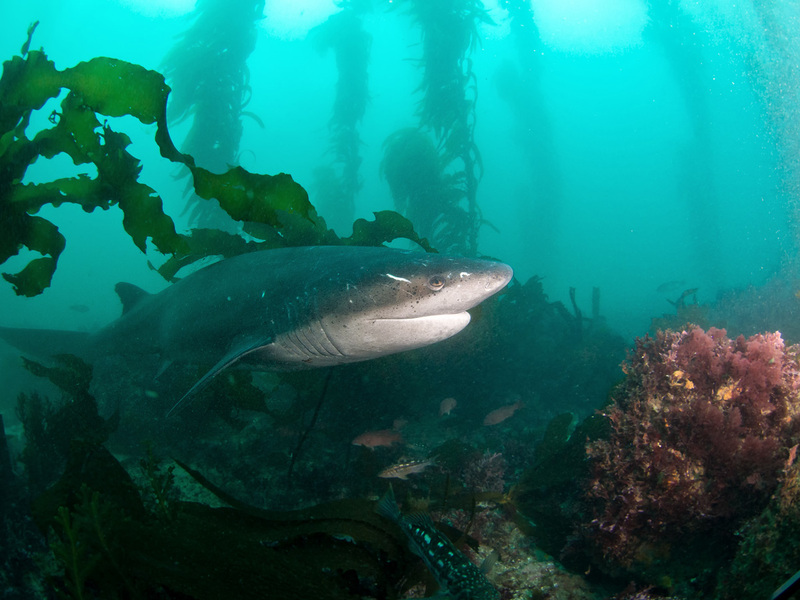 While the other species of cow sharks tend to prefer deeper waters, the sevengill shark can also found in shallow waters closer to shore, such as the areas in and around La Jolla Cove. Sevengill sharks have a dark gray to brown colored back, speckled with dark spots, while their bellies are lighter and cream colored. This countershading allows them to blend into their open-water habitat. Sevengill sharks are one of the larger species that we can see locally off of our coasts, as they can be close to 10 feet long. Their life span is about 50 years. Sevengill sharks are thought to be social sharks, as divers often report seeing multiple sevengills in an area at once. This social interaction may also be helpful for hunting as sevengill sharks are opportunistic feeders, using both pack hunting and scavenging strategies to feed on a wide rang of prey, including small fish, rays, other sharks, and marine mammals. They are able to feed on such a wide variety of prey items due to their unique teeth, with sharp jagged teeth in their upper jaw for holding prey, and wide comb shaped teeth in their lower jaw for ripping and tearing. While best known for his work with our local leopard sharks, Dr. Andy Nosal, Birch Aquarium’s DeLaCour Fellow for Ecology & Conservation, has also been doing some research on the sevengill sharks. In fact, he was able to tag a few of them earlier this summer. Andy’s work may allow us to better understand the movements of these mysterious, prehistoric looking sharks. Shark Summer 2014 at Birch Aquarium is sponsored by ESET. I have observed this species being caught at the San Clemente Pier. Knowing that they have, in the past,been quite rare in inshore SoCal, and that they have always birthed in SF & Humb.Bays, could they now be using San Diego Harbor for birthing also? Over the past 5 years or so, we have been seeing many more sevengills in southern California, including the kelp forest off La Jolla cove. No one knows why we are seeing this increase. We have begun tagging and tracking sevengills around La Jolla and should have some preliminary results in a year or so. We see both sexes in southern California, so it is certainly not just the females coming in. We do not know where they give birth or if they give birth in southern California. We have detected at least 3 sevengills that were tagged in San Francisco by our acoustic receivers in La Jolla, so the two populations are definitely connected. I have not heard of people seeing sevengills in San Diego Bay, so they may be giving birth elsewhere along the coast. We do see juvenile (a few feet long) sevengills in La Jolla, so it seems reasonable that they may be giving birth somewhere in southern California, or else the little ones are migrating south from pupping grounds farther north along the coast. Short answer, we are just beginning to studying this species in southern California and don’t have the answers yet. Stay tuned! Hi, anybody here? I hope I’m commenting correctly. Hello! I apologize for the delay, I did not see your question before. Let me check in with our shark expert and I hope to get an answer for you soon. Thank you for your patience! Your comment came through. I can’t answer your question but I hope someone does. I’ve always been fascinated by sharks. Been kayaking a few times at La Jolla shores and I think I saw a gill shark. Thank you for the responses. I’ve been fascinated by these creature’s as far back as my memory allows. I have many more questions, but I plan to space them out. I know you have plenty of other things to do.